What do you hope summer will bring for you? Are you nurturing plans for those longer, warmer days? It’s all too easy to let the season disappear while you focus on to-do lists and errands, chores and projects. When you are busy multitasking and rushing from one thing to the next, suddenly the warmer days have grown cooler as summer passes you by. 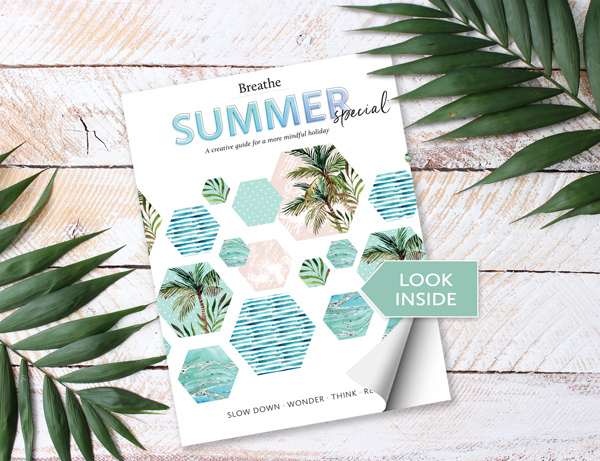 Rest assured, this Breathe Summer Special will allow you to plug your toes firmly into the Earth, so you can feel grounded, connected and grateful for each day. Whilst the passage of time is beyond our control, we’re hoping the mindful activities, reflective exercises, puzzles and inspiring yogic insights held within these pages may help to change your perception, so you can pay attention to those precious, passing moments and live fully in each of them. Divided into four sections – Slow down, Wonder, Think, Reflect – each of which providing readers the opportunity to challenge their minds, relax and ruminate on future plans, and most importantly, be present in the here and now. Modern life is often all about doing-rushing-racing; this mindful special is about learning to be present in the here and now. So slow down, breathe, make time, curl up somewhere comfortable and feel your mind and body relax as you savour each cherished moment of your summer.